No matter what you sell, you need secure and scalable e-commerce solutions that meet the demands of both your customers and business. Engage customers through customized products and offers, process transactions quickly and securely, and focus on fulfillment and customer service. More customers mean more transactions. Make sure you’re ready to handle every transaction smoothly by designing an e-commerce purchasing experience that’s simple to navigate. Then, deploy it to a secured and compliant e-commerce platform. You need an e-commerce solution that adapts to the size and seasonality of your business. When demand for your products or services takes off—predictably or unpredictably—be prepared to handle more customers and more transactions automatically. Plus, take advantage of cloud economics by paying only for the capacity you use. Driving sales isn’t the only way to increase your bottom line. Save money by streamlining your supply chain, reducing support costs, and increasing satisfaction with your suppliers and sellers through online self-service portals. Improve inventory management and reduce shipping costs using order information and historical customer data. Your core business is selling. Not IT. 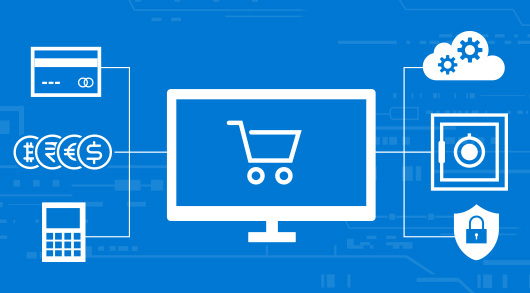 Take advantage of pre-built services in the cloud to create an e-commerce solution that enhances your sales performance and leaves the infrastructure management to your cloud provider. AbanteCart is a free, community-based e-commerce application with third-party marketplace extensions to generate additional revenue. nopCommerce is a universal e-commerce platform that combines the best of open source and commercial software to power all types of sites. Virto Commerce combines the best of Microsoft Azure, open-source .Net code, and agile development into one enterprise e-commerce platform. Inframon designs, builds, and supports hybrid cloud solutions to transform legacy IT into cloud computing models.